Visible light is an electromagnetic wave, which is composed of an electric field and a magnetic field. All electromagnetic waves are transverse waves. When it travels through space, its electric field and magnetic field are perpendicular to each other. A traveling electromagnetic wave with the electric field and magnetic field perpendicular to each other. The general plane electromagnetic wave has an electric field and a magnetic field perpendicular to each other, and is also perpendicular to the traveling direction of the light. 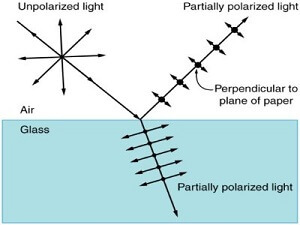 The polarized light of the light refers to the direction of the electric field, and the direction of the polar phase is also Often referred to as the direction of polarization. Lights with different polarization directions often have different reflection characteristics on the reflective surface. Photographers often use various polarizers to filter unwanted reflected light and take photos of various environmental light sources. The polarization technology of light used in liquid crystal flat panel displays and 3D movies. A polarizer is a device which allows a specific polarization of light waves to pass through and blocks other polarization. Two common types of polarizers are linear polarizer and circular polarizer. Polarizers are used in research labs, optical industry and equipment at homes. Available polarizers made by different materials such as glass, crystals or plastics. Plastic polarizers are not expensive and used in LCD (liquid crystal display). Such as screens of calculators or computer monitors, sunglasses, and 3D movie glasses. 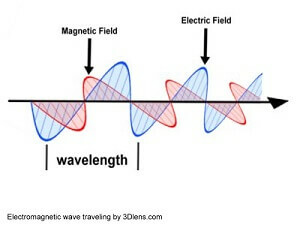 Electromagnetic waves may be unpolarized, partially polarized or completely polarized depending on the electric field vectors associated with the traveling waves. For example, visible light given by an incandescent light bulb unpolarized. When an unpolarized light travels, the electric field vectors are in all directions on a plane which is perpendicular to the direction of the wave travels. The electric field vectors symbolize the random directions of polarization of the individual waves that comprise the light. 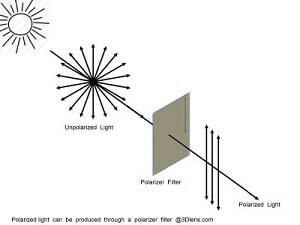 Linearly polarized light can be produced from unpolarized light with the aid of certain material called polarizer. Commonly used polarizing sheet or film consists of certain long molecules embedded in plastic. When the sheet is manufactured, it is stretched to align the molecules in parallel rows. When light sent through the sheet, electric field components along one direction pass through the sheet, while components perpendicular to the direction are absorbed by the molecules and disappear. In this case, the light is linearly polarized. If the electric field vectors are not completely random nor are perfectly aligned in one direction, it is called a partially polarized light. 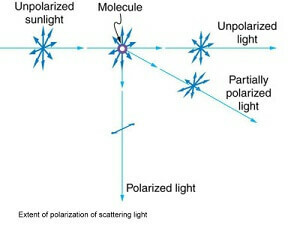 Polarization can be achieved through other processes such as reflection, refraction and scattering. 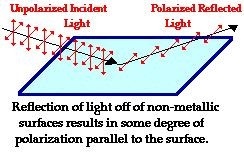 When unpolarized light is incident on a nonmetallic surface, the reflected ray is partially polarized. 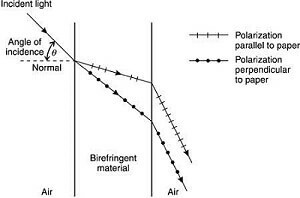 The extent of polarization depends upon the angle of incidence and the material that the surface is made of. Metallic surfaces reflect light with a variety of vibrational directions; such reflected light is unpolarized. However, nonmetallic surfaces such as asphalt roadways, snowfields and water reflect light such that there is a large concentration of vibrations in a plane parallel to the reflecting surface. This reflected ray is called s-polarized, the electric field polarized perpendicular to the plane of the incident ray and the surface normal. A person viewing objects by means of light reflected off of nonmetallic surfaces will often perceive a glare if the extent of polarization is large. Sunglasses with the proper polarization axis allows for blocking this polarization and reducing the glare. Polarization can also occur by the refraction of light. Refraction occurs when a beam of light passes from one material into another material. At the surface of the two materials, the path of the beam changes its direction. The refracted beam acquires some degree of polarization. This partially polarized refraction is called p-polarized, electric field polarized in the same plane as the incident ray and the surface normal. polarized parallel to the surface, the refracted ray being only partially polarized. This angle is called the Brewster angle. 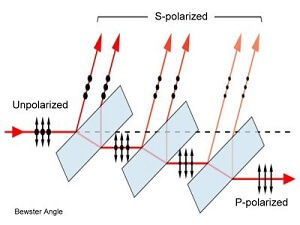 Unpolarized light can be separated into fully s-polarized and p-polarized light by stacking many plates at Brewster's angle with respect to the incident beam. Polarization also occurs when light is scattered while traveling through a medium. Since light waves are electromagnetic waves, they will vibrate the electrons of air molecules perpendicular to the direction in which they are traveling. The electrons then produce radiation that is polarized perpendicular to the direction of the ray. The observed light parallel to the original ray has no polarization. The observed light perpendicular to the original ray is completely polarized. In all other directions, the observed light scattered by air will be partially polarized. Circularly polarized light is in a polarization state in which, at each point, the electric field vector has a constant magnitude but its direction rotates with time at a steady rate in a plane perpendicular to the direction of the wave traveling. Circularly polarized light can be produced by passing linearly polarized light through a quarter waveplate (or retarder). Depending on the orientation of the quarter waveplate with respect to the electric field vector of the linearly polarized light, the final circularly polarized light can be in one of two possible states, right circular polarization in which the electric field vector rotates in a right-hand orientation with respect to the direction of propagation, and left circular polarization in which the vector rotates in a left-hand orientation. Waveplates, also known as retarders, transmit light and modify its polarization state by retarding (or delaying) one component of polarization with respect to its orthogonal component. 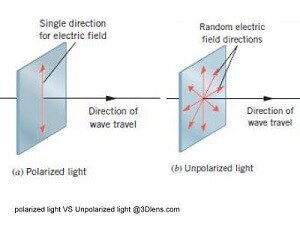 When unpolarized light passes through a wave plate, the waveplate is equivalent to a window, light remains unpolarized. However when a linearly polarized light passes through a wave plate, the orientation of the polarized light will be changed. The most commonly used wave plates are the half wave plate (1/2 λ) and the quarter wave plate (1/4 λ) . Birefringence - Waveplates are made from birefringent materials in which light splits into two different paths, each path has its own index of refraction. The component in the smaller index (fast axis) of refraction travels faster than that in the larger index of refraction (slow axis). In addition, the electric field vectors of both components are perpendicular to each other. The difference in the speeds of light in these two axes (called retardation) causes phase shift. Retardation can be measured in degrees, radians or wavelength. Light pass through a birefringent material. Quarter-wave plates are used to turn a linearly polarized light into circularly polarized light and vice versa. If the electric field vectors of the linearly polarized light form 45° to the fast axis or slow axis of a quarter wave plate (¼ λ), equal amounts of light intensity can pass through the wave plate as shown in Figure 10, As a result, when the wave at one point where the fast polarized component is at maximum, the slow polarized component is zero. 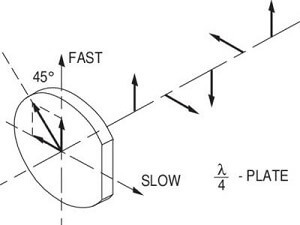 Due to the 45° phase shift between these two components, a circularly polarized light is produced. As stated earlier, the circular polarization can be either left-handed or right handed depends on the electric field at 45° to the left or to the right of the fast axis of the wave plate. Polarized film is created from rolls of polyvinyl acetate (PVA). The process begins by heating and stretching PVA to a much longer and thinner sheet. This lengthens PVA's long chain molecules, causing them to align. The stretched PVA is then dipped in iodine solution. The iodine is absorbed into the molecular chains forming long grids of parallel and darkened lines. The film is then dyed to the color of the desired finished film. The darker the film, the more polarization it provides. Once the PVA is dyed and dried, it is delicate and hard to handle. To stabilize it, the film is mounted on a sheet of cellulose acetate butyrate (CAB).